For other uses, see Reconciliation. Reconciliation bills can be passed on spending, revenue, and the federal debt limit, and the Senate can pass one bill per year affecting each subject. Congress can thus pass a maximum of three reconciliation bills per year, though in practice it has often passed a single reconciliation bill affecting both spending and revenue. Policy changes that are extraneous to the budget are limited by the "Byrd Rule," which also prohibits reconciliation bills from increasing the federal deficit after a ten-year period or making changes to Social Security. The reconciliation process was created by the Congressional Budget Act of 1974 and was first used in 1980. Bills passed using the reconciliation process include the Consolidated Omnibus Budget Reconciliation Act of 1985, the Personal Responsibility and Work Opportunity Act of 1996, the Economic Growth and Tax Relief Reconciliation Act of 2001, the Health Care and Education Reconciliation Act of 2010, and the Tax Cuts and Jobs Act of 2017. Reconciliation is an optional part of the annual congressional budgetary process. Typically, the reconciliation process begins when the president submits a budget to Congress early in the calendar year. In response, each house of Congress begins a parallel budget process, starting in the Senate Budget Committee and the House Budget Committee. Each budget committee proposes a budget resolution setting spending targets for the upcoming fiscal year; in order to begin the reconciliation process, each house of Congress must pass identical budget resolutions that contain reconciliation instructions. Other committees then approve bills that meet the spending targets proposed by their respective budget committees, and these individuals bills are consolidated into a single omnibus bill. Each house of Congress then begins consideration of their respective omnibus bills under their respective rules of debate. The reconciliation process has a relatively minor impact in the House of Representatives, but it has important implications in the Senate. In contrast to most other legislation, senators cannot use the filibuster to indefinitely prevent consideration of a reconciliation bill, because Senate debate over reconciliation bills is limited to twenty hours. Thus, reconciliation bills only require the support of a simple majority of the Senate for passage, rather than the 60-vote super-majority required to invoke cloture and defeat a filibuster. [a] Senators could theoretically prevent passage of a reconciliation bill by offering an unending series of amendments in a process known as a "Vote-a-Rama,"[b] but, unlike the modern filibuster, senators introducing these amendments must stand up and verbally offer the amendments. Though the reconciliation process allows a bill to bypass the filibuster in the Senate, it does not affect other basic requirements for the passage of a bill, which are laid out in the Constitution's Presentment Clause. The House and Senate still must pass an identical bill and present that bill to the president. The president can sign the bill into law or veto it, and Congress can override the president's veto with a two-thirds majority vote in both houses of Congress. The Byrd Rule defines any reconciliation changes to Social Security as "extraneous"—and therefore ineligible for reconciliation. The Byrd Rule does not automatically prevent the inclusion of extraneous provisions, but rather relies on objecting senators to strip provisions by raising procedural objections. Any senator may raise a procedural objection to a provision believed to be extraneous, which will then be ruled on by the Presiding Officer, customarily on the advice of the Senate Parliamentarian. A vote of 60 senators is required to overturn the ruling. The Presiding Officer need not necessarily follow the advice of the Parliamentarian, and the Parliamentarian can be replaced by the Senate Majority Leader. The Vice President as President of the Senate can overrule the parliamentarian, but this has not been done since 1975. In 2001, Senate Majority Leader Trent Lott fired Parliamentarian Robert Dove after dissatisfaction with his rulings, replacing him with Alan Frumin. Congress can pass up to three reconciliation bills per year, with each bill addressing the major topics of reconciliation: revenue, spending, and the federal debt limit. However, if Congress passes a reconciliation bill affecting more than one of those topics, it cannot pass another reconciliation bill later in the year affecting one of the topics addressed by the previous reconciliation bill. In practice, reconciliation bills have usually been passed once per year at most. Other restrictions have also been applied to reconciliation. For example, from 2007 to 2011, Congress adopted a rule preventing reconciliation from being used to increase deficits. Due to growing concerns over deficits and presidential control of the budget process, many members of Congress sought to reform the congressional budgetary process in the early 1970s. Charles Schultze, a former Director of the Bureau of the Budget, suggested a new process in which Congress would exercise greater control of the budget process by setting overall spending targets. Schultze proposed that Congress create a new type of legislation, the "final budget reconciliation bill," to ensure that the various budget-related bills passed by each congressional committee collectively fell within the overall spending targets passed by Congress. Schultze's ideas were adopted by Congress with the passage of the Congressional Budget Act of 1974, which established the reconciliation process, the Congressional Budget Office, and standing budget committees in the House and Senate. Under the original design of the Budget Act, reconciliation was expected to apply to revenue and spending within a single fiscal year. Although reconciliation was originally understood to be for the purpose of either reducing deficits or increasing surpluses, the language of the 1974 act refers only to "changes" in revenue and spending amounts, not specifically to increases or decreases. Former Parliamentarian of the Senate Robert Dove noted that in 1975 Senator Russell Long convinced the Parliamentarian to protect a tax cut bill. However, that bill was vetoed by President Gerald Ford. During the late 1970s, the process of reconciliation was largely ignored, in part because reconciliation could only be used during a brief window. In 1980, Congress amended the reconciliation process, allowing it to be used at the start of the budget process. Later that year, President Jimmy Carter signed the first budget bill passed using the reconciliation process; the bill contained about $8 billion in budget cuts. Reconciliation emerged as an important legislative tool during the presidency of Ronald Reagan. A coalition of Republicans and conservative Democrats used the reconciliation process to pass the Omnibus Budget Reconciliation Act of 1981, which contained various spending cuts. In addition to bypassing the filibuster, the reconciliation process allowed Congress to pass these spending cuts through a budget resolution and a single reconciliation bill, rather than through the traditional method of passing several bills addressing each area of spending. During the early 1980s, Congress passed reconciliation bills containing provisions that did not directly relate to the budget; for example, one reconciliation bill decreased the number of individuals on the Federal Communications Commission. 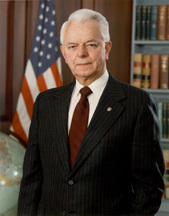 In response, Senator Robert Byrd led passage of an amendment to strike "extraneous" amendments from reconciliation bills, and Congress permanently adopted the Byrd Rule in 1990. The reconciliation process remained an important tool of congressional majorities even after the passage of the Byrd Rule. During the presidency of George H. W. Bush, it was used to pass the Omnibus Budget Reconciliation Act of 1990, which reduced federal spending and increased federal revenue. After taking office in 1993, Democratic President Bill Clinton won passage of his proposed budget, the Omnibus Budget Reconciliation Act of 1993 through reconciliation. In 1996, he signed another major reconciliation bill, the Personal Responsibility and Work Opportunity Act of 1996. In 1997, Congress passed the Taxpayer Relief Act of 1997, a reconciliation bill that reduced taxes and increased the federal budget deficit. The tax cut bill was paired with the Balanced Budget Act of 1997, which reduced spending, and the two bills were signed into law by President Clinton. In 1999, the Congress used reconciliation to pass the Taxpayer Refund and Relief Act 1999, which represented the first time that the reconciliation process was used to increase deficits without a companion bill that reduced spending. It was vetoed by President Clinton. A similar situation happened in 2000, when the Senate again used reconciliation to pass the Marriage Tax Relief Reconciliation Act 2000, which was also vetoed by Clinton. At the time, the use of the reconciliation procedure to pass such bills was controversial. Upon taking office in 2001, Republican President George W. Bush sought the passage of major tax cuts, but his party controlled only a narrow majority in the Senate. To avoid a filibuster, Bush and his congressional allies used reconciliation to pass the Economic Growth and Tax Relief Reconciliation Act of 2001 and the Jobs and Growth Tax Relief Reconciliation Act of 2003, two major tax cut bills that reduced federal revenues. To comply with the Byrd Rule, the tax cuts contained sunset provisions, meaning that, absent further legislation, tax rates would return to their pre-2001 levels in 2011. Portions of the Bush tax cuts were made permanent through the American Taxpayer Relief Act of 2012, though some of the tax cuts for high earners were not extended. Democrats won control of the presidency and increased their control over Congress in the 2008 elections, and newly-inaugurated President Barack Obama and his congressional allies focused on passing a major healthcare reform bill in the 111th Congress. The Senate passed a major healthcare bill in late 2009 without using the reconciliation process; because Democrats had 60-seat super-majority in the Senate, they were able to defeat Republican attempts to block the bill via the filibuster. While the House continued to debate its own healthcare bill, Democrats lost their 60-seat Senate super-majority following the death of Senator Ted Kennedy. [d] Following the loss of the Democratic super-majority in the Senate, House Democrats agreed to pass the Senate bill, while Senate Democrats agreed to use the reconciliation process to pass a second bill that would make various adjustments to the first bill. The original Senate bill was passed by the House and signed into law by President Obama as the Patient Protection and Affordable Care Act (ACA). Subsequently, the House and Senate used reconciliation to pass the Health Care and Education Reconciliation Act of 2010, which contained several alterations to the ACA. In 2016, Republicans passed a reconciliation bill to repeal parts of the ACA, but it was vetoed by President Obama. After gaining control of Congress and the presidency in the 2016 elections, Republicans sought to partially repeal the ACA and pass a major tax cut bill in the 115th United States Congress. As the party lacked a 60-vote super-majority in the Senate, they sought to implement both parties through separate reconciliation bills, with the healthcare bill passed using the reconciliation process for fiscal year 2017 and the tax cut bill passed using the reconciliation process for fiscal year 2018. Republicans were unable to pass their healthcare bill, the American Health Care Act of 2017, because three Senate Republicans and all Senate Democrats voted against it, preventing the bill from gaining majority support in the Senate. With the defeat of their healthcare bill, congressional Republicans changed their focus to a separate reconciliation bill that would cut taxes. Both houses of Congress passed a tax cut bill in late 2017, though the Byrd Rule required the stripping of some provisions deemed extraneous. After both houses of Congress passed an identical tax cut bill, President Trump signed the Tax Cuts and Jobs Act of 2017 into law in December 2017. Because of Byrd Rule restrictions, the individual tax cuts contained in the Tax Cuts and Jobs Act of 2017 will expire in 2027 barring further legislative action. ^ Reconciliation is not the only legislative process not subject to a Senate filibuster, but other processes, such as trade promotion authority, only apply in narrow circumstances. ^ The "Vote-a-Rama" does not conflict with the twenty hour limit on debate over reconciliation bills because that limit applies only to debate, and not to the process of voting on amendments. ^ Currently, the Byrd Rule prevents an increase in the deficit beyond a ten-year "budget window." Some members of Congress have proposed extending the budget window to 20 or more years. ^ Republican Scott Brown won a special election held to fill the vacancy caused by Kennedy's death. ^ Davis, Jeff (January 19, 2010). "How Reconciliation Would Work". New Republic. Retrieved July 18, 2017. ^ a b c Reich, David; Kogan, Richard (November 9, 2016) . "Introduction to Budget 'Reconciliation'". Center on Budget and Policy Priorities. Retrieved July 18, 2017. ^ Davis, Jeff (October 15, 2017). "The Rule That Broke the Senate". Politico. Retrieved March 29, 2019. ^ Heniff Jr., Bill (November 22, 2016). The Budget Reconciliation Process: The Senate’s “Byrd Rule”. Washington, DC: Congressional Research Service. Retrieved April 19, 2019. ^ Binder, Sarah (March 24, 2017). "Here are 3 things we learned from Republicans' failure to repeal Obamacare". Washington Post. Retrieved March 25, 2017. ^ Jagoda, Naomi (June 28, 2017). "Rift opens in GOP over budget strategy". The Hill. Retrieved March 29, 2019. ^ "Firing Or Ignoring The Parliamentarian – It's Called Leadership". Retrieved February 22, 2010. ^ According to Robert Dove, chief Senate Parliamentarian for 12 years; "Healthcare reform and reconciliation a bad mix, ex-parliamentarian says". The Hill. Retrieved March 2, 2010. ^ Rosenbaum, David E. (May 8, 2001). "Rules Keeper Is Dismissed By Senate, Official Says". The New York Times. ISSN 0362-4331. Retrieved April 24, 2017. ^ a b c Matthews, Dylan (November 23, 2016). "Budget reconciliation, explained". Vox. Retrieved March 29, 2019. ^ Meyers, Roy T.; Joyce, Philip G. (2005). "Congressional Budgeting at Age 30: Is It Worth Saving?" (PDF). Public Budgeting and Finance. Vol. 25. pp. 68–82. ^ "Analysis | The budget rule you've never heard of that ties Republicans' hands on Obamacare". Washington Post. Retrieved May 7, 2017. ^ "Congress Sends Obamacare Repeal to President for First Time". NBC News. Retrieved May 7, 2017. ^ Viebeck, Elise (September 20, 2017). "Why Senate Republicans are in such a rush this month on health care". Washington Post. Retrieved March 30, 2019. ^ Pear, Robert; Kaplan, Thomas (July 27, 2017). "Senate Rejects Slimmed-Down Obamacare Repeal as McCain Votes No". The New York Times. ISSN 0362-4331. Retrieved July 31, 2017. ^ Reynolds, Molly E. (December 2, 2017). "Four lessons from the Senate tax bill". Brookings Institution. Retrieved March 29, 2019. ^ Faler, Brian (December 20, 2017). "Senate passes tax bill, teeing up final House vote". Politico. Retrieved March 29, 2019. ^ Wagner, John (December 22, 2017). "Trump signs sweeping tax bill into law". Washington Post. ^ Everett, Burgess (April 17, 2018). "McConnell considering vote to make tax cuts permanent". Politico. Retrieved March 29, 2019. Heniff, Bill Jr. (2016). "The Budget Reconciliation Process: The Senate's "Byrd Rule"" (PDF). Congressional Research Service. Keith, Robert, and Bill Henniff Jr. The Budget Reconciliation Process: House and Senate Procedures. Washington, D.C.: Congressional Research Service, 2005. Lynch, Megan S. The Budget Reconciliation Process: Timing of Legislative Action Washington, D.C.: Congressional Research Service, 2016. Lynch, Megan S. (2018). Budget Reconciliation Measures Enacted Into Law: 1980-2017 (PDF). Washington, DC: Congressional Research Service. Reynolds, Molly E. (2017). Exceptions to the Rule: The Politics of Filibuster Limitations in the U.S. Senate. Brookings Institution Press. ISBN 978-0815729969. Dauster, Bill. "The Day the Senate Died: Budget Measure Weakens Minority." Roll Call, May 30, 1996, 5, reprinted in Congressional Record (June 12, 1996), vol. 142, S6135–36. Dauster, Bill. "The Monster That Ate the United States Senate." Public Budgeting and Finance, vol. 18, no. 2 (Summer 1998): 87–93. Frumin, Alan S. "Congressional Budget" in Riddick's Senate Procedure, 502–642. Washington, D.C.: Government Printing Office, 1992. Lynch, Megan S. The Budget Reconciliation Process: Timing of Committee Responses to Reconciliation Directives Washington, D.C.: Congressional Research Service, 2016. Mann, Thomas E.; Norman J. Ornstein; Raffaela Wakeman; and Fogelson-Lubliner. "Reconciling With the Past", with chart. The New York Times, March 6, 2010.